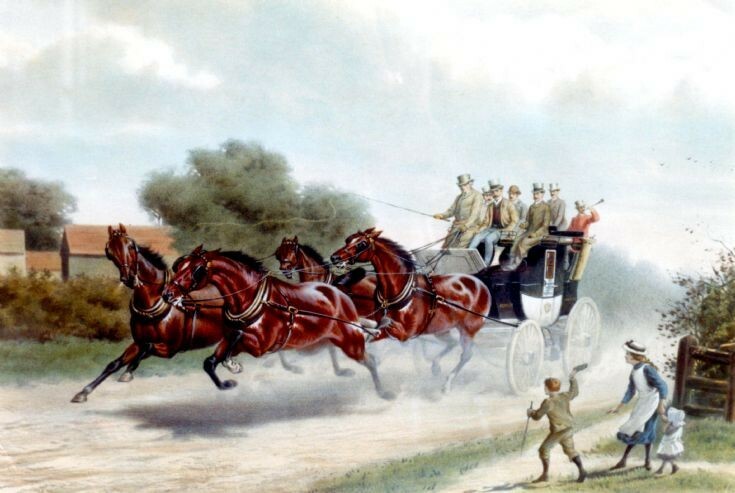 This painting depicts the stagecoach “Old Times” in a race against time for a wager of £5000 to £500 against it being accomplished in eight hours. The race covered a route from Piccadilly in London to the Ship Hotel in Brighton, and return! The victorious driver was Capt. Carlton V. Blyth from Cornwall who completed the return journey in 7 hours and 50 minutes. The painting shows the coach travelling through Lowfield Heath, with Captain Blyth third from left. Click on Large Version to view a detailed summary of the race issued in 1926. The horses were changed in 62 seconds at Pease Pottage, but they “galloped through” Handcross 8 minutes later. I wish I could have witnessed it coming down Handcross High Street!